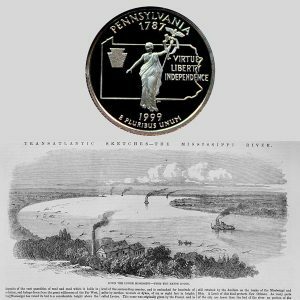 Today, the Pennsylvania State Quarter Coin remembers when the first steamboat on the Ohio river left Pittsburgh for New Orleans on October 29, 1811. That boat building was an early industry would be a natural result; the forests furnished the material and the navigable rivers the demand. There were three ship carpenters in the enumeration of the inhabitants in 1761, and doubtless boats were built during the occupation of Fort Duquesne by the French. The first boats constructed were unquestionable bateaux for the transportation of the trader’s peltry and provisions. Keel boats soon followed, with a capacity from twenty to thirty tons; some of the larger ones were designated as “arks” capable of loading enough people, with their cattle, to form a settlement. The shipyards of Pittsburgh were mentioned as early as 1766 by travelers; during the Revolutionary War, gunpowder was brought by boats from New Orleans, and bateaux were built for the transportation of troops. It was not, however, until the commencement of the nineteenth century that any substantial foundation was to be laid for shipbuilding, which was to become the leading industry of Pittsburgh for the first quarter of that century. A company of French merchants of Philadelphia under firm name of Tarascon, Berthoud & Company commenced in 1801 the building of vessels and keel boats to navigate the Ohio river. The originator of the undertaking was Louis Anastasuis Tarascon, a wealthy and enterprising Frenchman who established himself in 1794 in Philadelphia as an importer of silk, French and German goods. He sent in that year two of his clerks, Charles Brugiere and James Berthoud, to prospect the Ohio and Mississippi rivers from Pittsburgh to New Orleans to ascertain the practicability of clearing ships from Pittsburgh to the West Indies and Europe. Their report was favorable, and Tarascon in 1801 sent his brother and others with twenty-six ship carpenters, joiners and other mechanics to Pittsburgh. A wholesale and retail store was established, warehouses built, a ship-yard, rigging and sail loft, anchor shop, block manufactory, and everything necessary to complete a vessel for sea. The firm built in the summer of 1801 the schooner “Amity,” of 120 tons burthen, and the ship “Pittsburgh,” of 250 tons burthen. The following spring the schooner sailed for St. Thomas, having flour as a cargo, and the ship, loaded with flour, to Philadelphia, thence to Bordeaux, France. The next year the brig “Narino” was launched, with a tonnage of 250 tons; the following year the ship “Louisiana,” of 300 tons, and the ensuing year the ship “Western Trader” of 400 tonnage. The “Louisiana” was ballasted with coal and other articles and sent to Philadelphia, where the coal sold for thirty seven and a half cents a bushel. Previous to this time, travel and traffic on the western rivers was carried on exclusively in flatboats, several months being taken on a passage from New Orleans; the first ascent being made by thirty bateaux from the Mississippi river with one hundred and fifty men with supplies for Fort Duquesne. As already mentioned, on February 23, 1777, fourteen carpenters were sent from Philadelphia to the Monongahela river, fourteen miles below Fort Pitt, to build thirty bateaux forty feet long, nine feet wide, thirty-two inches deep, to serve in transporting soldiers. The ship “General Butler”; the schooners “Allegheny,” “Conquest,” “Monongahela,” and “Farmer.” The “Ann Jean,” the last of the 450 tons burthen ships built in this vicinity, was launched at Elizabethtown on the Monongahela. Tradition states that a Pittsburgh vessel visited an East India port and was about to be confiscated by the customhouse official, because they had no record of any such clearing port. The captain of the ship traced upon a map his circuitous route backward to the headwaters of the Ohio and thence secured a release of his vessel. It was built by Robert Livingston, Robert Fulton and Nicholas I. Roosevelt, 138 feet long, 30 feet beam, and between 300 and 400 tons burthen. The steamboat was wholly constructed in Pittsburgh—-engine, boiler and machinery, at a cost of $40,000. The launching took place in March, 1811, and she started on her initial trip for New Orleans on October 29, 1811. Though steam navigation was a success in eastern waters, the tortuous and varying channels of the western rivers had not been solved. On the initial trip of the “New Orleans,” the only passengers were Mr. and Mrs. Nicholas I. Roosevelt, the crew, an engineer, captain, pilot and six hands, two female servants, a cook, waiter, and a Newfoundland dog. The people of Pittsburgh assembled en masse to bid the steamboat a speed voyage which was to change the relations of the West. On the second day, Cincinnati was reached, and two days later the boat reached Louisville. Here a public dinner was given to Mr. Roosevelt, he reciprocating with dinner to his hosts on board of the steamboat. In the midst of the festivities, rumblings were heard, a perceptible motion of the vessel was noticed, and the company on reaching the upper deck found that instead of drifting towards the Falls of Ohio, the New Orleans was making good headway up the river, leaving Louisville in the distance downstream. The voyage, however, was not resumed, owing to low stage of water, until the last week in November, and was daily confronted with peril and fright, beginning with thrilling passage over the Falls at Louisville, followed by days of darkness attendant upon the comet of 1811, the earthquake of that year, pursuit by Indians, and fire on board, but in course of time the “New Orleans” reached Natchez. From this port to New Orleans there was no occurrence worthy of note. The steamboat plied between Natchez and New Orleans as a common carrier until the winter of 1814, when she struck a snag and was lost at Baton Rouge, Louisiana. The Pennsylvania State Quarter Coin shows with an image of steamboats on the Mississippi, circa 1858.